"... no machine to equal it as a fighting machine"
Captain Hughes' approbation for the Bristol Fighter was in reference to the Bristol F2B with a Falcon III 275 hp engine, which he had flown with No 62 Squadron. The Bristol Fighter had however made a poor start on the Western Front with No 48 Squadron. The original production aircraft, the F2A with the Falcon I 190 hp engine, was not as powerful and initial fighting tactics failed. Standard armament was a forward firing Vickers gun and a rear Lewis gun (sometimes a twin Lewis). On 5 April 1917 No 48 Sqn carried out their first offensive reconnaissance with a Flight of six F2A's led by Captain Leefe Robinson VC. They were engaged over Douai by Manfred Von Richthofen's Jasta 11 with five Albatros DIII's. Adopting two-seater defensive tactics to give their rear gunners good firing opportunities the F2A formation proved too vulnerable and four were shot down (including Robinson). On 11 April three further aircraft were lost in action with Albatros DIII's. Further losses occurred on 16 April, this time without enemy action, when five 48 Sqn aircraft ran out of fuel over enemy lines, four aircraft being destroyed by their crews to avoid their capture. 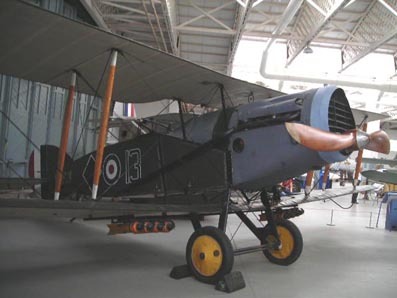 Not surprisingly Von Richthofen's early assessment was that "the new British aeroplane was not to be feared". By the end of April new tactics were being tried favouring engaging the enemy with the front gun. This immediately improved the situation and as F2B's arrived at the front with more powerful engines, the aircraft developed a well deserved reputation as a fighting machine. 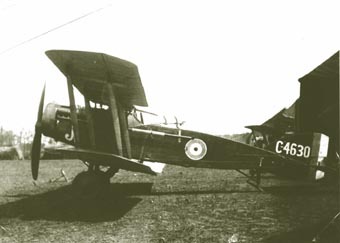 The CO of 48 Sqn, Major Bettington, writing in mid May 1917 was full of praise for the Bristol Fighter "she is a topping two-seater ... faster than the Hun two-seater but cannot touch the Albatros Scout for speed. Where she does score tremendously is in her power to dive ... Many Huns who have dived on the tail of one, missed and gone on diving, have been dived after and overtaken, and destroyed." He went on to explain "They are dived plumb vertically for thousands of feet until the noise is like that of a million sabres cleaving in the air." He estimated that the speed in the dive might be as much as 230 mph plus. Writing just after the war Captain Geoffrey Hughes MC, AFC an experienced Bristol Fighter pilot, who saw action from February to May 1918 with No 62 Sqn, made the following remarks: "there is no machine to equal it as a fighting machine. In the hands of a really good and dashing pilot the Bristol even without a back gun is a match for all except the very finest pilot on a single seater." Captain Hughes could speak with authority having had Manfred Von Richthofen on his tail on 13 March 1918. He went on to say: "Its finest quality is its dive to which there seems no limit. Its powers of endurance are quite remarkable - I used the same machine and engine from the time the squadron mobilised till I came on Home Establishment [Nov 1917 to May 1918 - it was eventually brought down and captured on 19 May after Hughes had returned to HE]." Captain Hughes was credited with 11 victories including Lothar Von Richthofen whom, together with his observer Captain Claye, he shot down on 13 March 1918. Wingspan 39', length 25', height 9' 9''. Take off weight with full load approx 2,800 lbs. 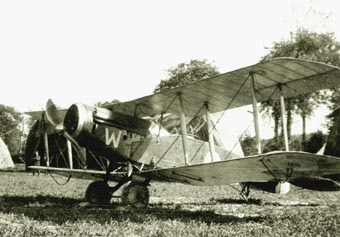 By July 1918 seventeen squadrons had been equipped with Bristol Fighters, in France Nos 11, 48 and 62 Squadrons were assigned primarily to fighter duties, Nos 20, 22 and 88 to fighter-reconnaissance, Nos 9 and 12 to Corps reconnaissance (according to Harvey only 22 and 62 Sqns were solely fighter units). In UK Nos 33, 36, 39, 75, 140 and 141 were assigned to home defence. In Italy Nos 34 and 139 were employed as fighter-reconnaissance squadrons, and in Palestine, No 111 Squadron's aircraft had passed to No 67 Squadron (No 1 AFC) in a fighter role. The highest scoring ace on Bristols was Canadian Lt Col Andrew McKeever MC & bar, DFC, DSO of No 11 Sqn with 31 victories between June and November 1917 all but two against Albatros DV's. The second highest scoring pilot was Capt. Samuel Thompson MC, DFC of 22 Sqn with 30 victories before being killed in action on 27 September 1918. Other aces included Canadian Capt. Atkey of 22 Sqn (29), Capt. Gurdon of 22 Sqn (28), Capt. Latimer of 20 Sqn (28), Capt. Middleton of 48 & 22 Sqns (27), Capt. Harvey of 22 Sqn (26), Capt. Staton of 62 Sqn (26) and Canadian Capt. Thomson 20 Sqn (26).